Every parent wants to do what’s best for their children. However, when parents are bombarded by conflicting messages, it can be a struggle to try to determine what is best. Every decision – from the type of car seat to purchase, to how to soothe a fussy child – elicits a variety of opinions. But when it comes to protecting our children from dangerous and sometimes deadly diseases, parents should rely on evidence based information from trusted sources. 1.) The diseases we can prevent through immunization are dangerous and sometimes deadly. The 14 different diseases that we can now prevent through vaccination had once injured or killed thousands of children in the U.S. each year. Today, we may hardly ever see these diseases, but the fact remains that these diseases still exist and can be extremely dangerous, especially to children. There are lots of other vaccine preventable diseases that we see more frequently here in the U.S., such as flu, measles and pertussis. So far during the flu season, over 150 children have died from flu. And in the past few years, we’ve seen a resurgence of measles. Back in 2014, there was an outbreak involving 667 cases of measles in 27 states. Another large multi-state outbreak linked to an amusement park in California occured in 2015 involved 147 people. And more recently, an outbreak in MN resulted in the hospitalizations of a dozen children. Learn more about the 14 different diseases we can prevent through vaccination with this interactive eBook which includes a description of each disease, its symptoms and an explanation of how the disease can be prevented through immunization. 2.) Vaccines are safe and effective. Vaccines today are the safest they’ve ever been. Of course, parents are bound to hear stories from people on the internet claiming that their children were injured by vaccines. Since it is extremely difficult to validate these stories, parents should rely on evidence based information when making conclusions about the safety of vaccines. It is important to acknowledge that vaccines do come with a risk of side effects. However, since vaccines are administered to almost every child in the U.S., they undergo an enormous amount of safety surveillance and scrutiny by scientists, doctors, and healthcare professionals. The most common vaccine side effects are minor and include redness or swelling at the site of the shot, which is minimal compared to the pain, discomfort, and risk of injury and death from the diseases these vaccines prevent. Serious side effects following vaccination, such as severe allergic reaction, can happen, but are extremely rare. Considering the dangers of the diseases we are trying to prevent, the benefits of vaccines far outweigh the minimal risk of side effects. This video, as well as others available on our Vaccinate Your Family Facebook page, address some of the most common safety questions parents have about vaccines. 3.) Childhood vaccines contribute to the community immunity that helps keep everyone free from disease. Some vaccines are not administered until a child is 2, 6 or 12 months of age. Some vaccines even require multiple doses before a child receives optimal immunity. Prior to being fully vaccinated, these infants remain vulnerable to diseases that can be particularly dangerous for infants. Take pertussis as an example. People of all ages can be affected by pertussis. 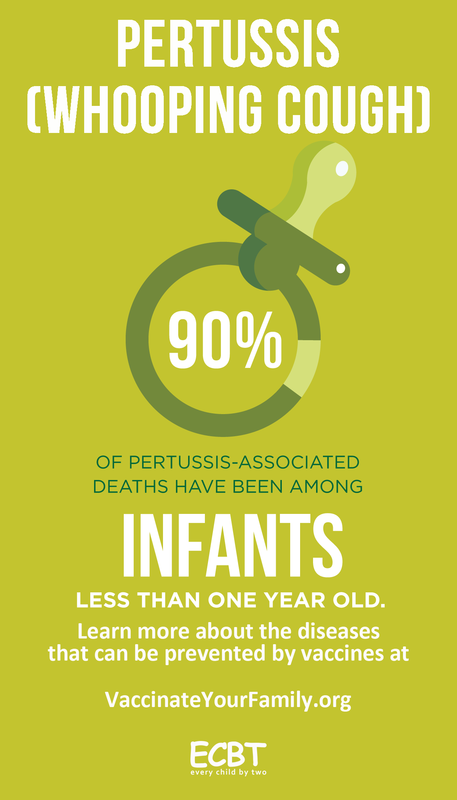 However, pertussis is especially dangerous for babies, since they are at particularly high risk of severe complications, hospitalization and death. In fact, about half of babies younger than 1 year who get the disease need care in the hospital, and 1 out of 100 babies who get treatment in the hospital die. Unfortunately, children need a serioes of five doses of Dtap vaccine over the course of five years before they are considered fully immunized against pertussis. During that time, they remain vulnerable to infection. In addition to infants, other individuals may also be more susceptible to the dangers of vaccine preventable diseases. This includes immunocompromised individuals who are medically unable to receive certain vaccines, vaccinated individuals who just didn’t generate a sufficient immune response from a vaccine, or even the children of parents who willingly refuse vaccines. 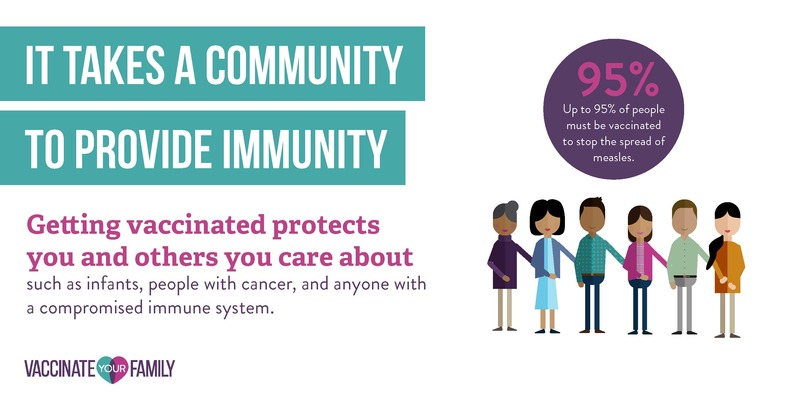 When a large percentage of a community is immune to a certain disease, it can reduce disease transmission and protect any individuals who can not protect themselves. To help keep everyone safe, from the youngest among us to the oldest, it is important that everyone who is able to be vaccinated contributes to the overall community immunity. This not only protects the infants in our lives, but also helps prevent the spread of disease to all our friends and loved ones. 4.) Immunizations aren’t only an investment in good health. They can save your family time and money. A child with a vaccine-preventable disease can be denied attendance at schools or daycare facilities. Some vaccine-preventable diseases can result in prolonged disabilities and can take a financial toll because of lost time at work, medical bills or long-term disability care. In contrast, getting vaccinated against these diseases is a good investment and usually covered by insurance. The Vaccines for Children program is a federally funded program that provides vaccines at no cost to children from low-income families. 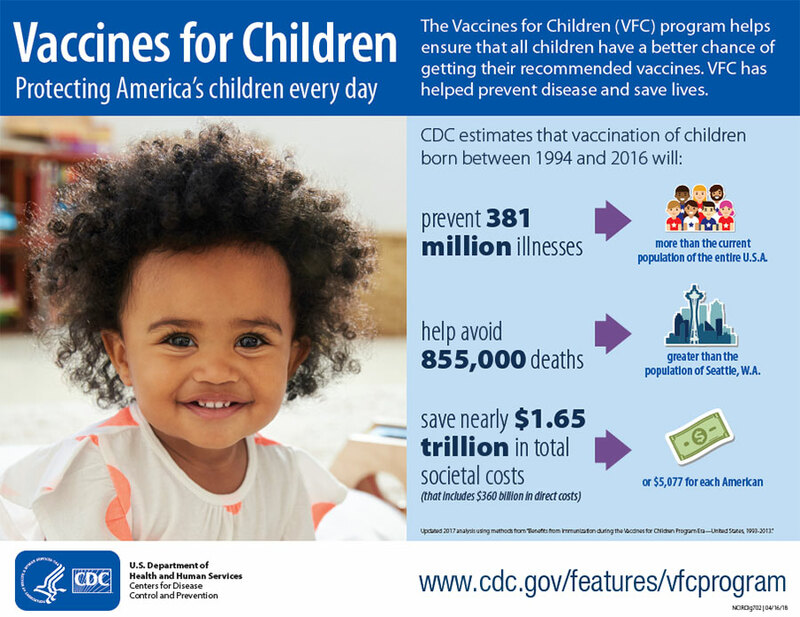 To find out more, visit the CDC VFC site, or ask your child’s health care professional. 5.) Today’s immunizations can improve the health of future generations. Vaccines have reduced and, in some cases, eliminated many diseases that killed or severely disabled people just a few generations ago. For example, smallpox vaccination eradicated that disease worldwide. Your children don’t have to get smallpox shots anymore because the disease no longer exists anywhere in the world. By vaccinating children against rubella, we have dramatically reduced the risk that pregnant women will pass this virus on to their fetus or newborn, and birth defects associated with that virus are seen in only rare cases in the United States when a pregnant woman who was never vaccinated against rubella is exposed to someone who contracted rubella in another country. If we continue vaccinating now, and vaccinating completely, parents in the future may be able to trust that some diseases of today will no longer be around to harm their children in the future. Today’s parents often question who they should trust when it comes to addressing their questions on vaccines. Sadly, there are plenty of people who make unsubstantiated claims or publish misleading or incorrect information about vaccines. But there are a few red flags that parents can look for when they are tring to evaluate the validity of information they read online. For instance, if you’re advised to “detox” your vaccinated child, or buy books, videos, supplements or natural remedies, than it would be wise to question the financial motives of the source, and the validity of the information they are promoting. For tips on how to evaluate health information online, check out the National Institute of Health’s website here. For a list of reputable sources on the topic of vaccines, visit the Vaccinate Your Family Resource page here. It’s hard to trust, especially if you had a bad experience. One nice thing about immunization science is that you do not need to trust any one expert: there are so many monitoring bodies, and so many sources looking at vaccines closely, that nobody can control all and actually hide a problem. One of the most heartbreaking things one can see is a child damaged by an infection that can easily be prevented by vaccination. Read up all you can!